The share of five most dominant varieties for each species of agricultural plants prevails in the majority of them, with the exception of maize, common wheat and potato. The total number of varieties in production for the stated three groups of agricultural plants from 1997 has increased, and a direction towards greater diversity is noticeable, while the number of varieties of other crops held steady or declined. The indicator presents the number and the share of varieties for each species or group of agricultural plants. It indicates the genetic diversity of each species of agricultural plants, the pressure of prevalent genotypes and varieties on genetic diversity in the system of agricultural production in Slovenia from 1997 to 2009. The indicator defines only the diversity in crop production and not the situation in the complete agricultural ecosystem. 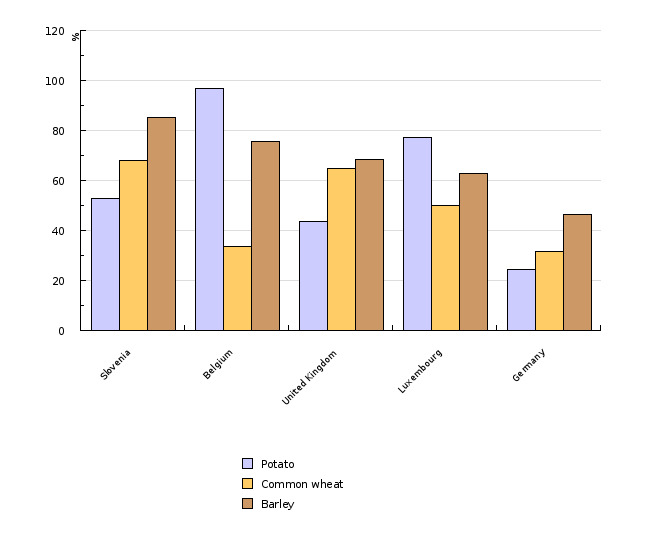 In the file EuroSemStats, maintained by the NIAB (National Institute of Agricultural Botany, Cambridge, Great Britain), the estimation is based on data from EU member states on the surface under seem production, and in Slovenia it is based on the data for joint crop production, except for potatoes, where we can assume the variety structure and production of potatoes for human consumption only on the basis of the data on sold seed potatoes. Genetic diversity of varieties and species of agricultural plants is a part of global biodiversity. With higher intensity of farming, the production of traditional, old varieties, and species is decreasing and related to that - genetic and species variety. The reason for this is the use of small number of modern varieties, intended for intensive farming production, which are mainly originating from the same source and thus limiting genetic diversity. 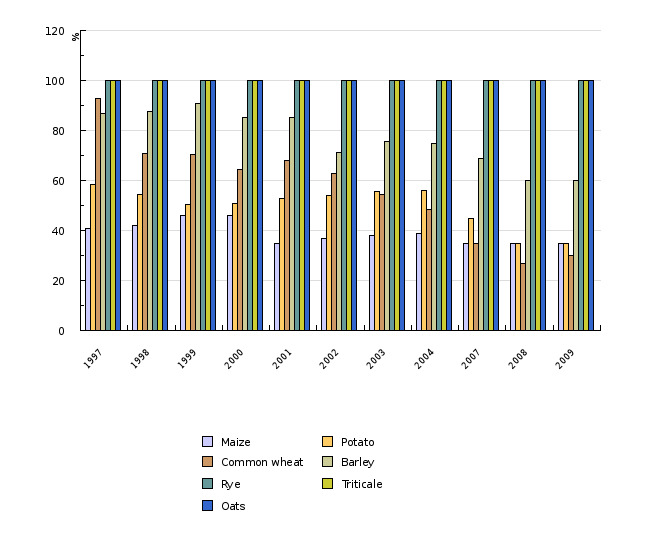 The total number of maize, common wheat, and potato varieties in production has increased from 1997 while the number of varieties of other crops held steady or declined, e.g. oilseed varieties. In the last year, we noticed a sharp decline in the number of wheat and fodder plants varieties. The reason for the decline is that for many varieties, which were before on the list of varieties and later on the list of varieties for which marketing is permitted in Slovenia, the date of authorized marketing has expired. New entries are made very rarely on the list of varieties and besides that the common catalogue is applicable. In practice, more varieties are placed on the market and real data are difficult to obtain (there are also no official data). In addition these data are not be comparable to the data from previous years (other source of data). In the period 1990 to 1997, the production of wheat in Slovenia was based on two varieties, namely Marija and Ana. Over 60 % of arable land was sown using these two varieties. 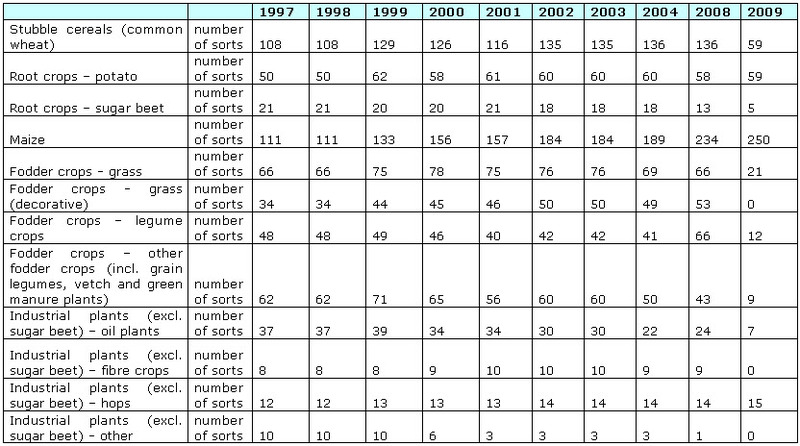 In the period 1997 to 2008, the number of varieties in sowing structure of wheat increased considerably. This year we are observing a drastic decline of varieties included on the list of varieties, due to the fact that in March 2009, the temporary permit for marketing expired for more than half of varieties included. The variety Žitarka has the largest share followed by Soissons, Profit, Renan, and in the last years Isengrain. In Slovenia, we produce barley mainly for fodder and similar to wheat, its production in the period 1990 to 1997 was based on three varieties. The number of barley varieties in production considerably increased after the year 2000. The potato variety structure changed considerably in the last twenty years. Before 1989, domestic varieties, bred in Slovenia prevailed and after the spread of virus PVYNTN. The assortment of potato varieties almost completely changed after 1990, and domestic varieties almost disappeared from production. By extending Slovenian list of varieties in the last years, the number of varieties sold is increasing, and at the same time, the shares of particular varieties in overall production are decreasing. The total number of maize hybrids in the period 1990 to 1997 declined for more than four times, which is the consequence of the interrupted market exchange between the former republics of Yugoslavia. After 1997, the number of hybrids incrised to 234 in 2008 and to 250 in 2009. The reasons for relatively many maize hybrids on the list of varieties and on the common market are diverse climate and soil conditions, which enable the production of hybrids of all maturity classes. Until about 2000, mainly older foreign varieties and domestic Slovenian varieties of fodder crops prevailed on our market. After the year 2000, the sowing structure started to change with the arrival of some newer foreign varieties. At that time the seed production of Slovenian varieties was abandoned, so that they almost completely disappeared from the market. In the last three years, Slovenian varieties began to reappear in a smaller extent. For grass and legume crops market it was typical until the last year that the choice was more diverse: if in the former period two or at the most three varieties prevailed for each species, there are now several for most species in the sowing structure. However, for legume species, that are sown mainly in annual mixtures, there are only one or at the most two varieties in the sowing structure. This applies for the entire period from 1990 to 2009. This year the number of varieties of fodder plants declined for similar reasons as for the cereals. Source database or source: Data for the calculation of the indicator were taken from the List of Released Domestic Varieties of Agricultural Plants and Foreign Varieties (Cultivars) of Agricultural Plants Whose Introduction for Production in the Republic of Slovenia Was Permitted (Ur. l. SFRJ for the period 1987–1990), List of Varieties of Arable Crops, Vegetables, Vine and Fruit Plants, Seed Catalogue of the Semenarna Ljubljana, d. d, Overview of Registered Varieties and Varieties whose Marketing in the Republic of Slovenia is Permitted and The Statistical Yearbooks of the RS for the last ten years. Data administrator: The Phytosanitary Administration of the RS, Ministry of Agriculture, Forestry and Food of the Republic of Slovenia, Semenarna Ljubljana, d. d.., The Statistical Office of the Republic of Slovenia. Methodology and frequency of data collection for the indicator: Data are summarized from annual reports and publications of the Ministry of Agriculture, Forestry and Food of the Republic of Slovenia – The Phytosanitary Administration of the Republic of Slovenia (source: Report on the State of Agriculture, Food Technology and Forestry and PARS MAFF publications for the period 1997–2009) and the data on the sale of seeds for each arable crops (source: PARS, MAFF, Semenarna Ljubljana, d. d. – unofficial data). The basic source is the data on applications for the protection, inclusion, and exclusion from the National list of varieties, and also the Yearbooks of the Statistical Office of the Republic of Slovenia. For the period before 1990, the only source is the List of Released Domestic Varieties of Agricultural Plants and Foreign Varieties (Cultivars) of Agricultural Plants in SFRJ. Data processing methodology: The indicator indicates the number and the share of varieties for each species or group of agricultural plants. - Advantages and disadvantages: We can assess the variety structure of the potato production only on the basis of the data available for sold seed potatoes. The data available underestimate the number of varieties resistant to Y virus, which the producers are able to propagate by themselves and are not covered by the statistics. If the basis would be the list of varieties for 2008, the data would be considerably underestimated according to the actual situation. Marketing of some varieties of fodder and industrial plants is permitted, but they were deleted from the list of varieties. In addition, marketing of all varieties from the Common Catalogue is permitted. The presented data are the closest to the actual situation however, in our opinion, the number is still somewhat overestimated, since number of varieties from the list are not placed on the market. Source database or source: Data from EuroSemStats database 2002 were used. Data administrator: NIAB (National Institute of Agricultural Botany, Cambridge, UK). Methodology and frequency of data collection for the indicator: Data are summarized from files forwarded by NIAB. Actual data are not available yet. Data processing methodology: The indicator presents the number and the share of varieties for each species or group of agricultural plants. Geographical coverage: EU-15 consists of old EU Member States: Austria, Belgium, Denmark, Finland, France, Greece, Ireland, Italy, Luxembourg, Germany, the Netherlands, Portugal, Spain, Sweden, and the United Kingdom. For selected countries, Belgium, United Kingdom, Luxembourg, Germany, comparison of the used and presented data was possible.